The Buchlov castle is a royal castle that, along with Bare Hill (Czech: Holý kopec) and Saint Barbara’s Chapel, belongs to significant dominants of Chřiby mountains in Moravian Slovakia, which is a region in south-eastern Moravia, Czech Republic. The castle was built approximately in the first part of the 13th century, but archaeological finds suggest that the area around Buchlov castle was settled in the oldest periods of civilization. The function of the castle was defensive, agricultural and administrative as well. The first form of the castle had a similar ground-plan as buildings of that era. It was created by two massive prismatic towers situated on opposite parts of a rocky plateau. A high palace on the southern part of the yard was built at the same time and it was surrounded by a wall. The second constructional period proceeded already in 70’s of the 13th century. Another tower was built and in the second floor of this tower there was a chapel that belonged to the most valuable objects of early Gothic architecture of the day. There is an opinion that a model for this chapel was one of French royal chapels. Unfortunately, during later capturing of Buchlov Castle by armies of Hungarian king Matthias Corvinus in the second half of the 15th century, the chapel was destroyed so much that it was abandoned. It was replaced by two large rooms serving as store and depository. And although the castle was a permanent possession of a king until the 16th century, it was often given in pawn to aristocratic clans. Nobles of Cimburk owned it in the end of the 15th century. At that time a representative chivalric hall was built. In the year 1511 the castle was given to a private hold, and from the 16th to 18th century various Moravian clans changed its hold. The most important were the nobles of Žerotín, Zástřizl and Petřvald. Constructional work continued in Renaissance style. Some parts of the castle were added in baroque style. However, in 1701, the Buchlovice Castle was finished and in 1751 the owners moved there indefinitely. The last holders became earls of Berchtold’s clan in the year 1800. A family museum came into existence in the castle thanks to the brothers Leopold I Berchtold and Bedřich Berchtold. In the half of 19th century the museum was opened to public. 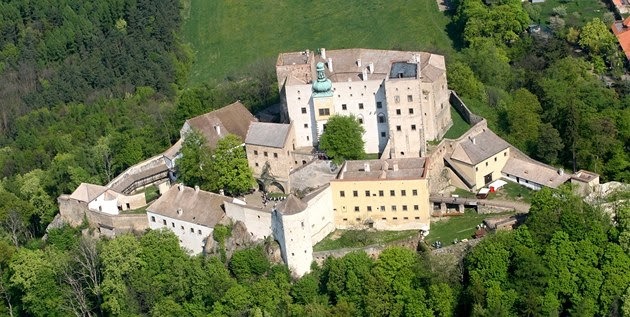 The castle was confiscated on the bases of Beneš decrees in 1945 and became the ownership of Czechoslovakia. Later, it was also added to a list of national cultural monuments. Nowadays it is open to public. Day and night visits with many cultural programmes and actions are held during the year. Saint Barbara’s Chapel also called Barborka came into existence in the 13th century, and it was used as a funeral crypt for holders of a manor of Buchlov. Later it was rebuilt and finished in the year 1672. It is built in early baroque style on a cruciform plan with a central cupola. It is one kilometre far away from Buchlov castle. Two pilgrimage divine services are held to this day.